Last February I set myself a goal for these next three months (February, March and April): to learn Gaelic. The time is up and I must confess I have not made a lot of advances. The reasons are plenty, and most are shared with whoever wants to learn a new language. They are even harder for people learning a few languages at once, the kind of language nerds that have way too many Teach Yourself books on languages. I also have some solutions to approach the problems... Now I just need to apply them wisely. As you may remember, I'm doing my PhD in Mathematics. I'm close to its end (or at least it looks so), and this means it eats even more time than before. In addition to this, I write regularly (or semi-regularly) here in mostlymaths.net and 100perZen.net, I'm learning to play guitar and have picked drawing (to have some more non-thinking time) again. I'm also attending a course on how to make your own shoes (yes, really). And together with Laia we are opening an Etsy shop. All quite time consuming! Learning a new language can be split in really small steps: one word or declension a day, even. But I'm not hard-wired into doing so little with languages, and as such I try to do at least half a lesson a day, when time permits. But time never does! Solution: I'm currently trying to use memorisation techniques (like memory palaces and mental associative chains) in my language learning experience. It is not easy, as memory palaces are not very well suited for language learning, and abstract data (like foreign languages) are hard to code in its images. But I'm still trying. This would mean that if I could find one or two hours in a week, I could advance steadily. A forthcoming post will explore this with more detail as soon as I have more experience with it. My trip into Gaelic came from a guest post in Bitesize Irish Gaelic and several emails I exchanged with Eoin, who runs the site with his wife Saša. I got hooked into the language and the site, and for a while was very excited by the prospect of learning a new (and quite unknown) language. Then I started to realise how much time a language needs. It's not that I didn't know before, its just that I was trying to learn two languages at once. This is usually a recipe for failure, unless the languages are very close. 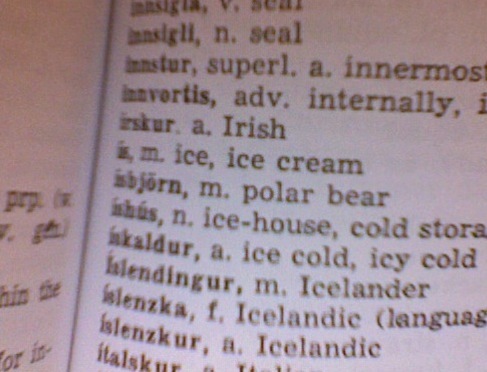 A few days ago I picked again my Icelandic book and I realised I had been telling myself to learn Irish without wanting to do it in that precise moment: I'm currently craving Nordic languages. When I opened my Swedish book it was like Hey, how fun is this!, the same went with Norwegian. Solution: Concentrate on Icelandic for now. After all, one of my New Year resolutions is to learn enough Icelandic to read Egil's Saga (and The Little Prince before it). Let's do it, and then I can go for another language branch with Gaelic. On my commute, reading RSS feeds or drawing. At home, blogging, drawing, laundry, chores. In my office, thesis. If there is always something else to do that has a biggest lead (like getting more visits to my blog, or having clean clothes), it is very hard to do something "just for fun" in our free time, if it is something that needs a big time expenditure. Solution: Fixed schedule. Set a specific moment in the day or schedule a few hours in the week for your language learning, just like if you were in a classroom. Two hours in a week, if bearable can do wonders. You can split it in two lessons per hour, or one lesson and one hour of reading with a dictionary, or one hour of online chatting. Do it enjoyable! What are your language learning problems? And your solutions for my problems? If you enjoyed this post, please share it with your friends.